The Wells Cathedral Choir is based in Wells, Somerset and carries on a glorious 1100-year-old tradition of choral music at Wells Cathedral. The members of the Choir include 18 boy choristers, 18 girl choristers and 12 adult male singers known as the Vicars Choral. The group is recognized as one of the finest choirs in the world, and is led by Matthew Owens, who has been the Organist and Master of the Choristers of Wells Cathedral since 2005. This disc features Owens conducting the Choir performing an assortment of Christmas carols. 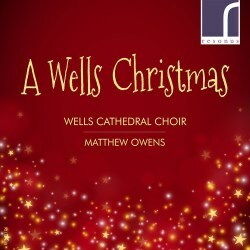 Owens composed Lullay, my liking, a soft, sweet lullaby inspired by a fifteenth century poem celebrating the Christ child, and this is its world premier recording, featuring soloist Madeleine Perring beautifully singing verse and the Choir answering in refrain. Head Boy Chorister James Gooding performs several lovely tenor solos, singing verses of What child is this?, a carol composed by Thomas Hewitt Jones, and Tomorrow shall be my dancing day, a traditional English tune arranged by noted choirmaster and composer Sir David Willcocks. This is the truth sent from above, arranged by Ralph Vaughan Williams, was first published in 1823 and is also known as “ The Shropshire Carol”. The slow, stately tune is enhanced by outstanding solo verses sung by Hugh Latta and William Drakett. Bob Chilcott is one of the most widely performed composers of choral music in the world. This disc features the world premiere recording of his arrangement of Sussex Carol, as well as the first recording of his lively composition The Sparrow’s Carol, with text by Charles Bennett. Jefferson McConnaughey’s moving composition In the bleak midwinter also receives it’s world premier recording on this disc. The tune was inspired by the poem written by Christina Rosetti, which has similarly inspired Christmas carols by Gustav Holst and Harold Drake. John Rutter is another well-known and popular composer, arranger and conductor of choral music whose work is represented here. He wrote arrangements for I Saw Three Ships, an English carol first published in the 17th century, and Sans Day Carol, a tune which originated in the 19th century near the village of St. Day, located in the parish of Gwennap, Cornwall. John also composed the dashing Jesus Child, a contemporary holiday carol and the intriguing Donkey Carol, a bold, adventurous and inspiring piece composed in 5/8 meter. Another version of I Saw Three Ships in this collection is performed entirely and splendidly by Jonathan Vaughn on the organ. The holiday favorite Have yourself a merry little Christmas was composed by Hugh Martin and Ralph Blane and was sung by Judy Garland in the 1944 MGM musical Meet Me In St. Louis. The Choir sings the bitter-sweet tune a capella, with outstanding dynamics and in superb harmony.